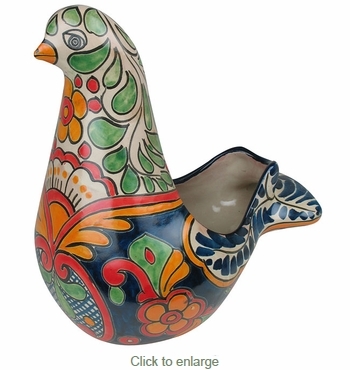 This small Talavera dove flower pot is hand crafted and hand painted in Mexico by skilled master potters. This colorful dove is sure to brighten up any room in your home. Traditional Assortment: The design shown is of the Traditional Talavera style. Your dove planter will be chosen from our current assortment of available colors and designs. The item you receive will likely be different than pictured here.